Your Editing Tools (located under Site Tools on the right side of your Toolbar) is where you can manage information and features that affect your entire site. Add To Site allows you to add new pages and galleries to your site. You can add up to 4 custom main or Top Level pages to your site. (Some may have already been added during the interview process). You can also add any number Sub Pages below your Top Level Pages. For example, if you have a Top Level page about cakes, you might add the following Sub Pages: Flavors, Icings, Fillings. If you need an extra Top Level page, you can rename existing Top Level pages to repurpose them. Page Options, located on the left side of the Toolbar, allow you to set options for the current page you are on. After editing the information, click Save Changes to save the changes or Cancel to discard the changes. By clicking Add To Page, located on the far left side of your Toolbar, you can add many types of content to your current pages, such as a block of text or a photo gallery. Use galleries to display photos throughout your website. Each photo gallery can have a title, description and as many photos as you want. To add a new photo gallery, click on Add To Site on your Toolbar and select Add A New Gallery Page. You will be prompted to enter the page's Meta Info. Click Save Changes when finished. The main photo gallery page on your website displays a list and preview of all the galleries you have created. Each gallery is represented by its title, description and a row of sample images. Visitors can click on a photo gallery's title to be taken to its individual gallery page. If a visitor clicks on a single image, they open that picture's detail page. Each individual photo gallery gets its own page. These pages are listed in a drop-down list when you mouse over the main photo gallery page on your website's navigation menu. They also show up as a preview on the photo gallery page. Each photo gallery has a title, description, and as many pictures as you want to add. The photo detail page shows the photo at full-size, as well as the photo's title and description. Visitors can click the next or previous arrows to navigate through the photo gallery. They can also jump to a specific photo by selecting it from the gallery thumbnail list displayed below the photo. Here you can change the visual appearance of your website, such as colors, background, header image and more. The window is divided into 3 sections: Colors and Patterns, Text Options, and Header Options. To get to your Edit Website Appearance options, select Site Tools on the right side of your Toolbar, then select Edit Website Appearance, the first option in the Site Tools menu. Link your social media to your website now! This feature allows you to link your business's social media accounts to your website. These links will be displayed on your website's Social page, as well as in other website features. This feature allows you to set company contact information, as well as serve by and location information for your business. This information will be displayed on the Contact Us page. Under Add To Site in your Toolbar, you will see Add A New Top Level Page. Here you can add a new Top Level page if you have not already reached your limit of 4. If you have reached the limit, rather than displaying New Custom Page it will show that you have already reached the limit and will advise you to reuse other pages. Click the New Custom Page option. Select which Top Level page you want to add it to. Under Add To Site in your Toolbar, you will see Add A New Gallery Page. Here you can add any number of photo galleries to your website. After clicking Add A New Gallery Page, you will be taken to the Page Options window where you can enter information about your gallery's page. More information can be found on Page Options. After entering the page information, click Save Changes to create the gallery page. The slider is a customizable tool that allows you to display images or new content in a continuously revolving fashion. To add a slider, select Add To Page from the Toolbar, then select Slider from the Content section of Add To Page. Content Boxes let you display various types of content in 2 or 3 side-by-side boxes. They're great for placing multiple types of content together in a horizontal row instead of vertically down a page. It's also great for showing content from other pages on the page you've selected. To allow people to leave you comments about your business or website, you can add a Page Comment box on your web page. Page Comments allows visitors to leave a comment on the page they are currently viewing, but these comments have to be approved before they are shown. View and moderate comments by going to Site Tools, and then Manage Page Comments. You can easily add an existing Photo Gallery to any page on your website. Under Add To Page in your Toolbar, click Media to find the Photo Gallery feature. This will bring up a window where you can select one of your site's photo galleries to add to the page. Simply choose the gallery you want to add and click Save Changes. Your gallery will be displayed with its title, description, and a row of 4 random images. Under Add To Page in your Toolbar, click Social, and then click on Social Media Icons. This displays icons for all the social media sites associated with your business that you've added to your website, such as Facebook, Twitter, Instagram, etc. 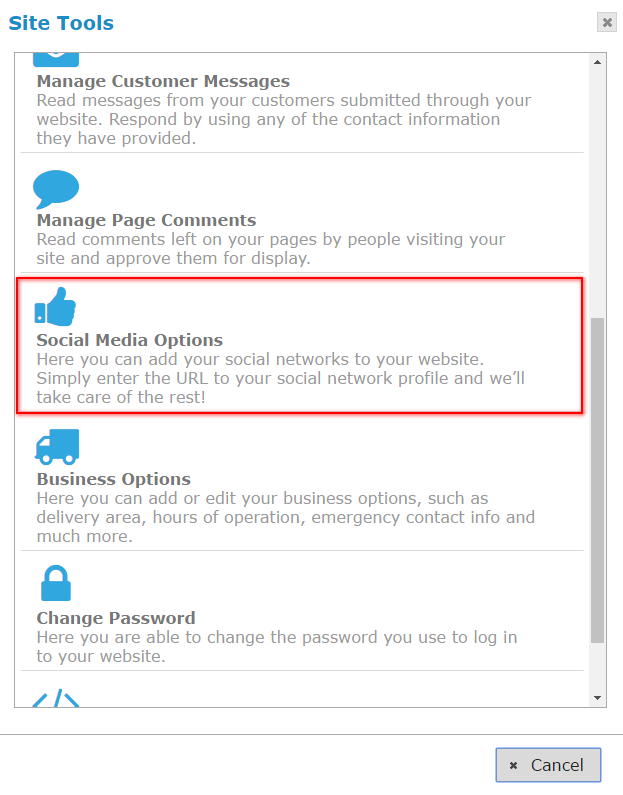 You can add or change your social media sites using the Social Media Options window, under Site Tools. An example of this tool can be found below. Under Add To Page in your Toolbar, click Forms to find the add Contact Form option. This tool displays a form on your current web page that a user can use to contact you through your website. You have a form like this already on your Contact Us page. There are no options for the Contact Form. This allows you to add Custom Scripts and meta tags to your website, such as tracking and verification codes from other sites. You can find Custom Scripts under Site Tools on your Toolbar. To add a custom script, first, grab the code. Then, type a name for your script in the Name box. Select which Pages you want the script to appear on from the dropdown menu, and then select the Location from the dropdown menu as well. When you receive a comment about your website through Atwill Media's Page Comment box, they will show up in Manage Page Comments under Site Tools to await further moderation. If you want to display a comment, just select the Display button. If you do not want to display a comment, click Do Not Display. If you think the comment isn't real and might be a spam comment, click Mark as Spam.